Good Justice League is not only my fix-a-cold reading, but knowing where to grab healthy dose from also helps when you read 'this is meant to be the Justice League' comics, by replacing the need for something to rinse the awful taste from your mouth when writers don't quite get the big guns right. That said - no run has nailed the J.L of A for me better than Joe Kelly's. His story-arc Trial By Fire has everything. Vandal Savage, time travel, epic villains, hacked off Green Lantern Guardians and character moments that pack as much punch as what you'd get pulling on Superman's cape. Oh yeah, and Wonder Woman bound by her own lasso and made to answer a question by Fernus, she would rather not. 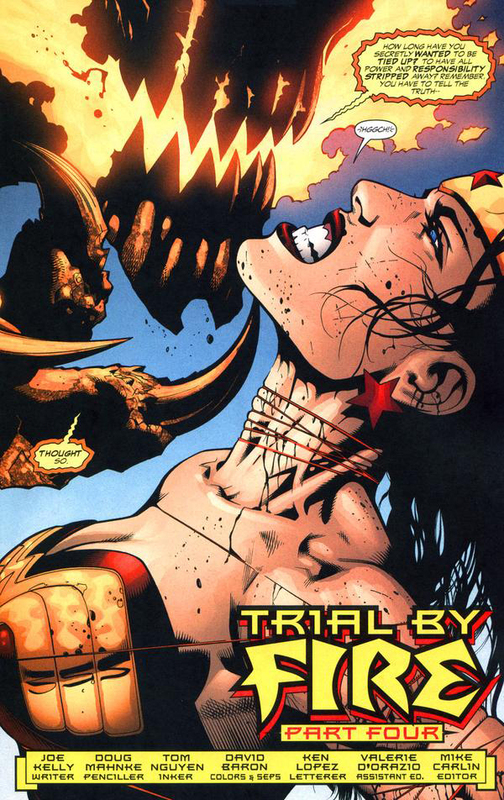 The way artist Doug Mahnke nailed that conviction in her eyes is the stuff of legend, and legend is what the JLA is all about. that is hot! i love the way the artist has her gritting her teeth. hey Dan check your email. it's saturday night in NZ it's not like your doing anything right? That's an amazing page. I'm amazed though that the first thing Dave noticed in that picture was her teeth. Feeling okay big guy? 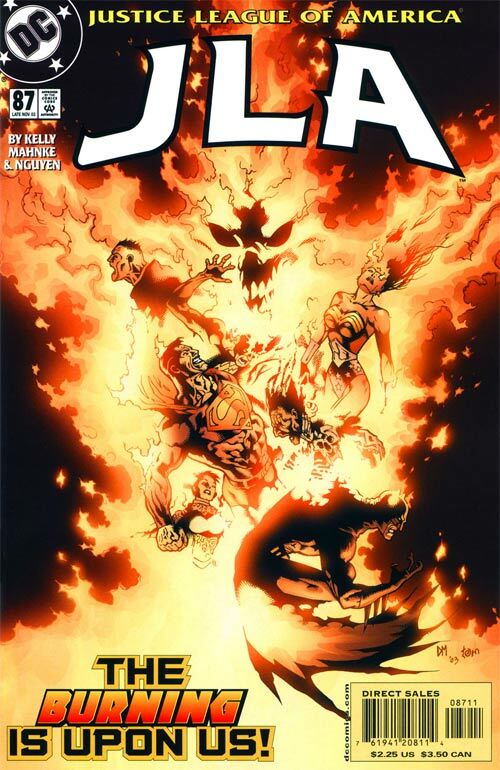 No one has managed to tell fantastic JLA stories on a level that Kelly and Mahnke brought to this title once upon a time. I could sit and reread their issues all day long. I'm the same TomO - there was definitely a great run in those pages. And where is Faith these days? She was really cooking for a while there! I noticed her neck. That's got to hurt.